From top models to Oscar-winning actresses, it seems like the crème de la crème of Hollywood were all in town last night. With its warm climes, sandy beaches and glamorous night spots, Dubai is known to attract many a celebrity, from Jennifer Lopez to Gwen Stefani (and that’s just in the last few weeks alone). However this week, A-listers gathered in huge numbers at one particularly glittering party. To celebrate the opening of the Bulgari Resort Dubai, stars from across the world jetted into the UAE to peek around the sprawling Jumeira Bay destination. Bulgari ambassador and supermodel Bella Hadid was joined by Oscar-winning actress Alicia Vikander, model and actor Jon Kortajarena, and model (and Emirates Woman December cover star) Jasmine Sanders for the bash, where guests were treated to ballet performances and live music. The ladies were decked out in the luxury label’s shimmering jewels (we particularly love Sanders’ necklace, encrusted with jewels coloured like the UAE flag). Bella Hadid, Jasmine Sanders and Alicia Vikander in Bulgari jewels. The Bulgari Resort Dubai is made up of 101 hotel rooms and 20 private villas, with the destination scheduled to open its doors to the public on December 7. Prior to its official launch, the celebratory party held on the seahorse-shaped island also featured pyrotechnic displays, a dinner by Michelin-starred chef Niko Romito and a performance from Italian jazz star Matteo Brancaleoni. Local icons were also in attendance, including Lebanese actress and model Nadine Nassib Njeim, Tunisian actress Hend Sabry, Egyptian power couple Mona Zaki and Ahmed Helmy, Lebanese singer Lara Scandar and Saudi TV presenter Sara Murad. Nadine Nassib Njeim and Bella Hadid. The hotel itself has been described as the “ultimate urban resort”, and will form part of Bulgari Resort & Residences Dubai, which will include 165 serviced one- to three-bed apartments when finished. 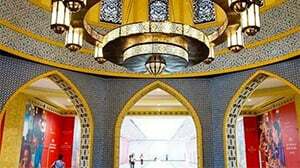 The hotel has previously been billed as Dubai’s most expensive, according to Bulgari’s executive vice president Silvio Ursini. “You can count on the fact that they [the hotel rates] will be by far the highest in the market,” he told Gulf Business this year, though prices haven’t yet been revealed. So, what exactly will you find at the resort? Well, if you’re in the mood for a high-end staycation, this sounds like it’ll tick all the boxes. The resort was designed by an Italian architectural firm, with Mediterranean-inspired landscaping, views of the Arabian Gulf and European-influenced boulevards. All the hotel rooms have been fitted out with luxury Italian furniture brands and marble bathtubs (so basically you’ll have a little taste of Rome right here in Dubai) but it’s the private villas that have really piqued our interest. With options ranging from one bedroom to three, each of the 20 villas comes with a private pool, personal butler service and a gazebo. You don’t have to spend the night to have a nose around the place, thanks to elegant eatery, Il Ristorante, which will have a menu full of Italian dishes created by Michelin-starred chef Niko Romito. There will also be Il Bar, a steel and bronze oval design with an outdoor terrace which sounds like an ideal spot for sundowners. Il Cafe will serve up Mediterranean cuisine, while the Lobby Lounge will offer Italian-themed teas, so it sounds like there’ll be something for every level of peckishness. For pampering, the resort will house a 1,700-square-metre spa, with eight treatment rooms and a 25-metre indoor pool. There’ll also be an on-site gym, as well as a private beach named La Spiaggia, which’ll have cabanas, a kids’ pool and club, and an outdoor pool. We don’t yet know if there’ll be day passes to buy but if there are, that’s our winter weekends sorted (there’ll also be a beach club for after-dark drinks too). The resort will also welcome the world’s first Bulgari Marina and Yacht club (which will sit along the complex’s promenade), with a 50-boat harbour, Italian restaurant specialising in seafood, a members’ lounge, outdoor pool and bar. The Dubai resort will join four other Bulgari-branded developments across the world, which include hotels in Milan, Bali and London, and eateries in Tokyo. There are also plans to open accommodation in China and Moscow in the very near future.